As I heightened my defenses against the mouse, he upped his game too. Shortly after writing my last post, I heard a trap snap, but when I checked the traps in the morning, the snapped one was empty. Also, all the peanut butter on the other traps was gone. All. of. it. But, I did find another package of 4 mousetraps. I came home from work that night, pulled everything out from under the sink, and wiped up some of the mouse droppings. So. gross. Then, I decided maybe I’d better watch a Youtube video about mousetraps. Sure enough, I was setting them all wrong. I tried to focus on the calm man telling me about the mouse traps and not look at the horrifying screen shots of related videos on the side of the screen, ones with glaring horror shots of mice and mice being snapped in traps. After getting a mouse trap education, I set seven snap traps and two glue boards and tucked everything back under the sink. With that done, I set forth on what I hoped would be a productive Friday night since I was leaving in the morning to spend the weekend near the hospital to see grandma. I prepared my quilt fabric, so I could get it all washed and ironed. I can shared the nice hues of greens, blues, and browns but can’t say what they are for. Then I worked on cleaning up the kitchen and started the dishwasher. 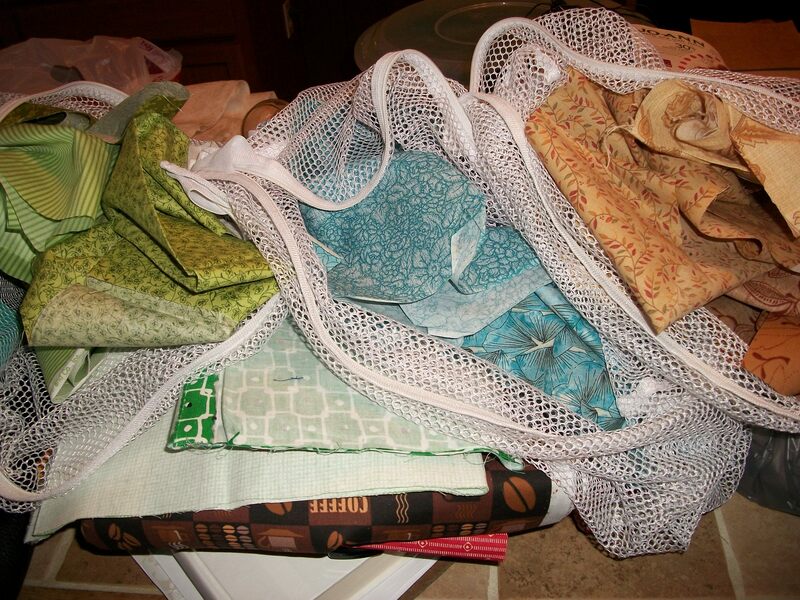 Later on in the evening, I went downstairs to pull the quilt fabric out of the dryer. There was a fairly substantial puddle of water near the drain in the basement. At first, I thought the dehumidifier was being overzealous though that’s never happened before. But, then I heard it. Water washing down the basement wall and dripping from the pipes under the dishwasher and the sink. To be honest, I’m so numbed by catastrophe in its minor and major keys at this point that I just kept dealing with the fabric in the dryer. Water was already flowing into the basement; I guess I figured that a few more minutes wasn’t going to make that big of a difference. I went upstairs, opened up the cabinet under the sink, and found the glue traps saturated with water. Clearly something had gone very, very wrong. Water was spurting out of the hole drilled in the side of the cabinet for the dishwasher supply lines. If the mouse had appeared at that very moment, I have no idea what I would have done. As it was, I shut off the dishwasher and grabbed the phone to call my mom though I was really trying to reach dad. He wasn’t home from work yet. Now, my mom is both my kryptonite and my comforter at the same time. I can be brave in bad situations until I talk to her; then I dissolve into tears. That happened back in elementary school when I slid down an ice pile, sliced my hand, and didn’t cry until I saw her in the school office. I happened in fourth grade when I chipped my tooth on a third grader’s head and didn’t worry about being a ghastly mess for the rest of my life until I saw her. And, I didn’t cry until I started telling her what I was looking at on Friday night. But, I tried to get off the phone kinda fast. I wanted to at least be a little brave for her. Immediately after I got off the phone, I laid my head on the kitchen counter and sobbed into the pile of rags I’d gotten to dry up the mess. I was like, “Really God? Really? I still miss the person I wanted to spend the rest of my life with, and my grandma is laying in a hospital. She’s been there for two weeks. That’s the big stuff, but then let’s talk about the bat and the possum and the constant torment of this mouse. And, now this!” Mix in a little PMS, and I was just shy of being a crumpled heap of humanity sliding down the side of the kitchen cabinets in despair. But, no one else was here to clean up the mess and I was mad too, so I dove under the sink and started mopping up the water and more mouse droppings. And, God was quietly implanting in my spirit. What if I want you to respond to this in a way that makes you stronger? What if I want to remind you that I will provide even if this does cost a couple hundred dollars to repair? What if I just want you to talk to me even if you’re really frustrated? I knew there was wisdom in those thoughts, but I still told God that I thought if I was going to deal with all this garbage, I should at least get a husband to help. It was an honest spiritual moment under the sink with the water and mouse poo, but it wasn’t a pretty one. Then, I stormed off to the bathroom to sob some more, run a hot bath, and read a book to just escape life for a little bit. After some restorative sleep and waking up to have to get rid of a very pudgy, peanut butter filled dead mouse, I did pray on the way home. Scattered prayers, but still, I refrained from tuning out God by listening to my audio book, probably partially because when I had tried to download a new one after my bath, my computer froze up. I guess God didn’t want to be ignored. And, I was able to visit my grandma who after giving us a real scare with a bowel obstruction was back on the mend again and starting to eat. I was able to rejoice in small things like taking some time to make meatloaf for my parents since my mom has been either at the hospital or work every day for the past two weeks. Mom came home and told me that she had wanted meatloaf; in fact, she had planned to make it for me so I could have leftovers but was just too tired to get to it. I was so glad that I had decided to make meatloaf; sometimes unexpected blessings can come in 9×13 casserole pans. And, then, I arrived home tonight with echoes of helpful friends’ Facebook posts, ones that reminded me that dishwashers can be fixed. That adventure in appliance repair was going to actually be the post of the night, but it was quite the road to climbing back under the sink after that first initial mopping up of last Friday, so I’ll let that adventure keep for another day. This entry was posted in Spiritual insights and tagged animals, grandma, gratitude, spiritual. Bookmark the permalink.